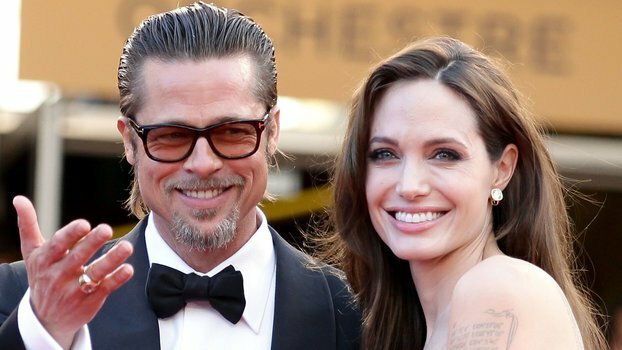 Home » Lifestyle » Angelina Jolie and Brad Pitt's Relationship Has Reportedly "Improved Tremendously"
Though their divorce proceedings exposed a Maleficent-level chill between Brad Pitt and Angelina Jolie (see: bifurcation drama), tensions appear to have lessened. The former couple, who were recently granted single status after nearly three years of informal separation, “have come a long way,” a source tells Entertainment Tonight. “To the surprise of many of their closest friends, their communication has improved tremendously and they’re both dedicated to co-parenting,” the insider explained. Ironing out a custody agreement for their six children (Maddox, 17, Pax, 15, Zahara, 14, Shiloh, 12, and twins Knox and Vivienne, 10) appears to have played a big role in their newfound amity. With the divorce drama behind them, both parties are focused on their own endeavors. Jolie has reportedly “moved forward and thrown herself into her work and children.” The Academy Award winner has several projects on the horizon, including a rumored role in Marvel’s The Eternals. “She’s working on some big movies and is very driven when it comes to her career, so she’s in a good place,” the source confirmed. Pitt, whose romantic life has been the subject of much speculation in the past couple years, is in fact dating, but “he’s a free spirit when it comes to dating. He is enjoying himself, nothing serious.” He, too, has some major projects in development, including Quentin Tarantino’s Once Upon a Time in Hollywood. Legal battles may come and go, but Brangelina is forever.